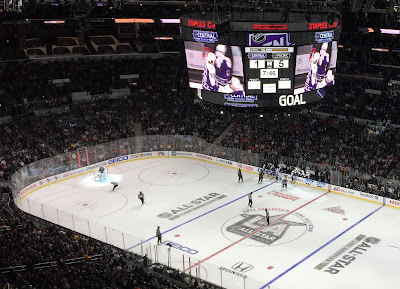 We stuck around for a bit, and then walked to the other side of Staples Center to see L.A. Live, the entertainment complex whose Microsoft Theater was the host of the NHL100 Gala, honoring the league's greatest players of all time. The event had just ended, so there were hordes of people outside who had gathered to catch a glimpse of some of the legendary athletes. At one point, Charlene and I walked along the street behind Al Michaels! I recognized a few players outside, and so did the autograph seekers who surrounded them, so we tried to stay out of the way for the most part. 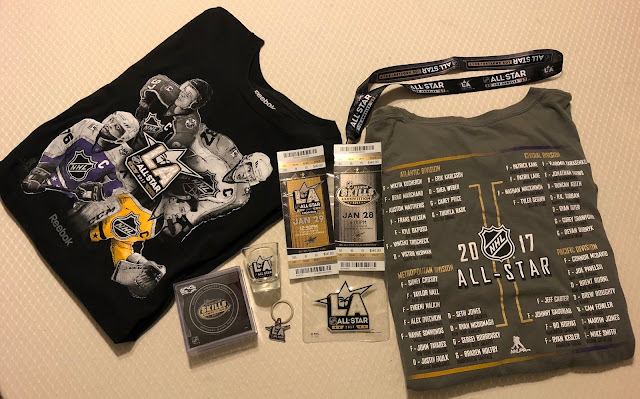 We grabbed dinner and went back to the team store inside of Staples Center to buy my official All-Star Game merchandise - I thought it would be easier to buy all of my souvenirs on this night, so I wouldn't have to carry them around during the following day. Believe me, they got plenty of my money, as I went home with a variety of memorabilia including a shot glass, keychain, program, puck, and two t-shirts. And I knew I couldn't leave without also buying a jersey to commemorate the occasion, so I decided on my favorite player - P.K. Subban of the Nashville Predators. I figured I would save that for Sunday. The rest of the Fan Fair featured displays to commemorate hockey in Los Angeles, as well as a giant section that housed the NHL's assortment of trophies - of course, this included the Stanley Cup. I've been fortunate enough in my life to have seen (and been photographed with) the Cup on many occasions, and the line was incredibly long, so we simply lingered around for a while before heading out to lunch. 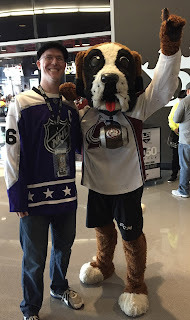 Being a longtime fan made this game quite special for me, as I got to see several fantastic players from my youth - in addition to Lindros, we got to see a host of legends like Peter Forsberg, Teemu Selanne, Ray Bourque and Joe Sakic take the ice. It seemed like every player had a smile on his face and it made for a lighthearted affair - Bieber's team, coached by Wayne Gretzky, would leave victorious when all was said and done. McDavid returned shortly thereafter to win the Fastest Skater competition - as you might expect, I couldn't really get a good photograph of him in action, but I did catch him while he was being interviewed later by CBC's Scott Oake. At this point, there was a break in the action to resurface the ice, so we used the opportunity to wander the concourse and try to get pictures with as many of the mascots as we could find. Let's just say we were rather successful! 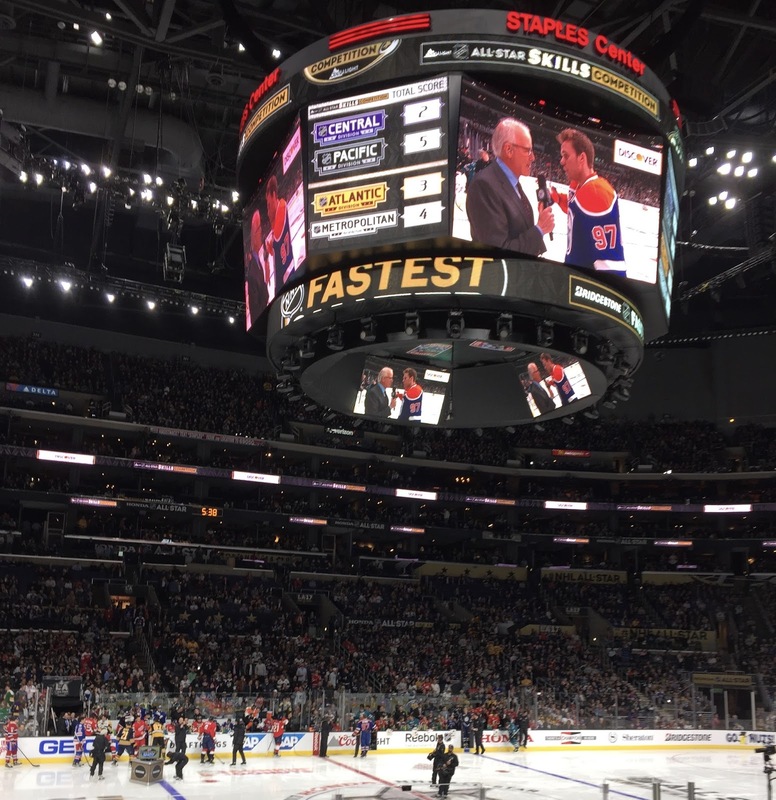 The competition resumed with the Hardest Shot contest - perennial champion Shea Weber of the Montreal Canadiens once again retained his title, narrowly escaping a fierce charge from Winnipeg Jets rookie Patrik Laine, who only lost by a scant 1.1 mph. 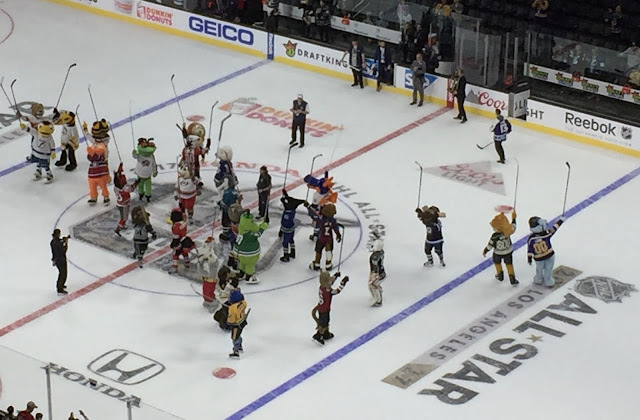 At last, the "NHL Shootout" breakaway event concluded the proceedings, with the Atlantic Division declared the ultimate winner for the evening. As a result, they chose to play in the second of the two divisional matchups on Sunday. 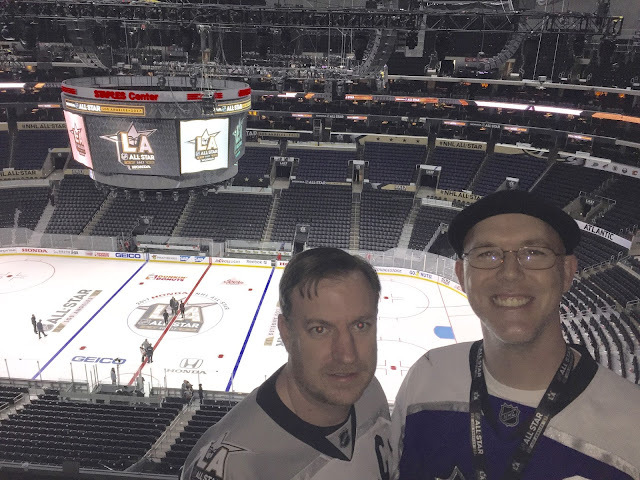 We were back at Staples Center nice and early on Sunday, and used the extra time to roam around and take in the atmosphere. 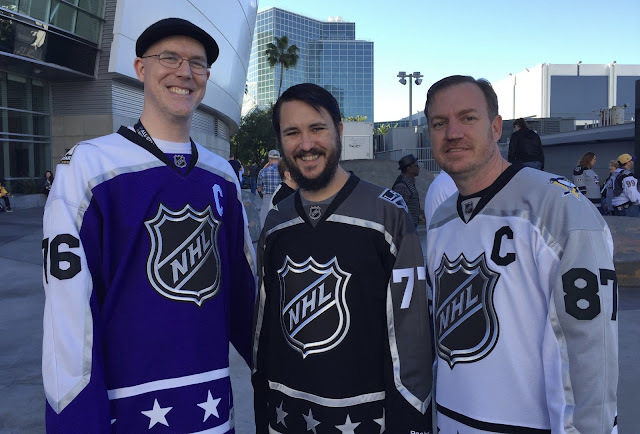 We met up with Doug Stolhand and Eddie Garcia, co-hosts of the popular Puck Podcast, who interviewed both of us for a Facebook Live segment. 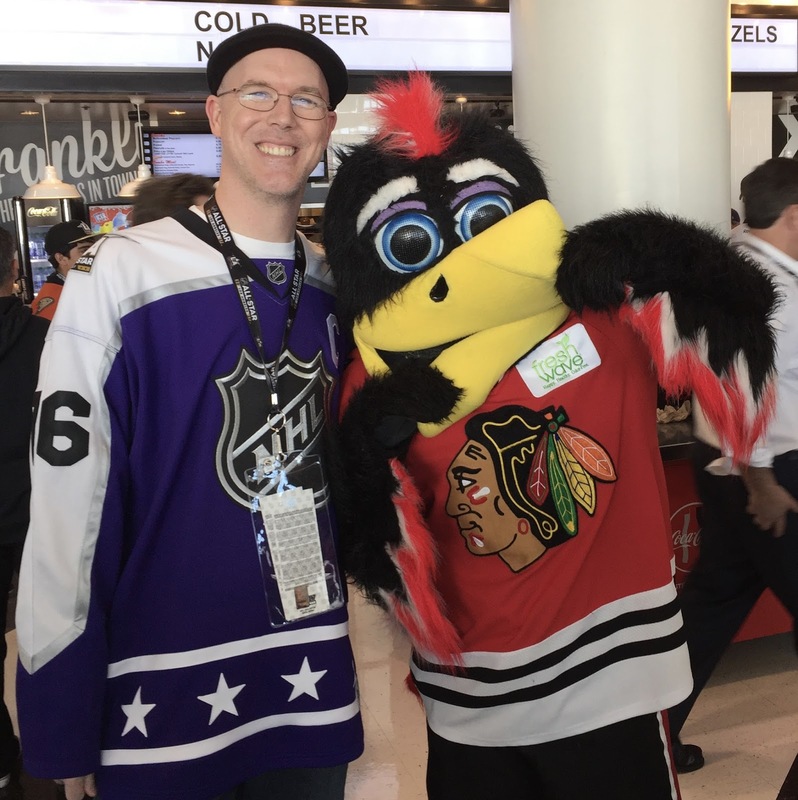 We found our seats in the upper bowl (I could only justify buying the expensive tickets for one of the two days, so I chose Saturday to sit close), and watched as the events commenced with one more tribute to the NHL's 100 Greatest Players. One by one, the legends in attendance walked out onto the ice and stood opposite their contemporaries from this year's All-Star Game. 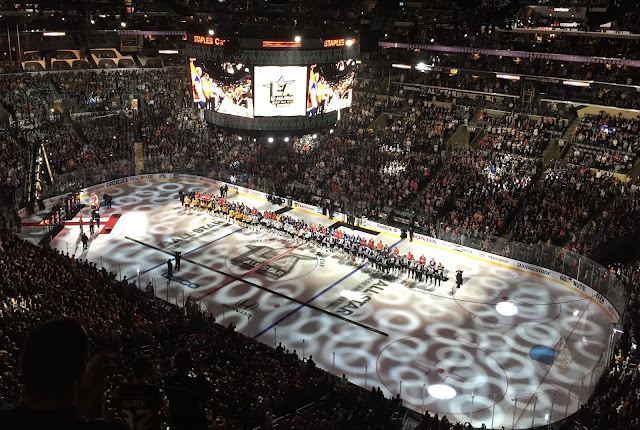 It was arguably the greatest collection of hockey talent EVER assembled in one place - and we got to see it all! Before we knew it, the semifinal games has begun. 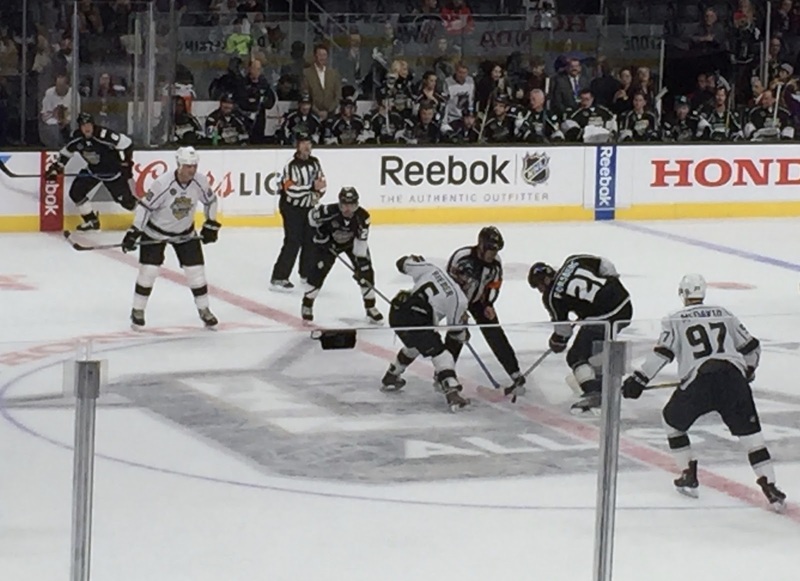 First up was the Central Division, captained by Subban, against the Connor McDavid-led Pacific Division. Following them would be Sidney Crosby and the Metropolitan Division team facing off with the Atlantic Division stars, led by Montreal goaltender Carey Price. The Pacific and Metropolitan teams took the ice for the championship, which turned out to be a much more tight-checking game. With the $1 million prize on the line, it seemed as though no one wanted to be the one to make a mistake that would change the momentum, so both teams took time to feel each other out. The Pacific Division would break through, scoring three times to take a 3-2 lead into the intermission. The second half of the game was even more defensive than the first: ultimately, Cam Atkinson and Wayne Simmonds scored five seconds apart and Braden Holtby didn't allow a goal, to help lead the Metropolitan Division to a 4-3 victory. Simmonds, still beloved by Kings fans after spending his first three seasons in Los Angeles, would be named the MVP. All in all, it was a tremendous experience - and I'm so glad I got to see it without even having to travel anywhere. 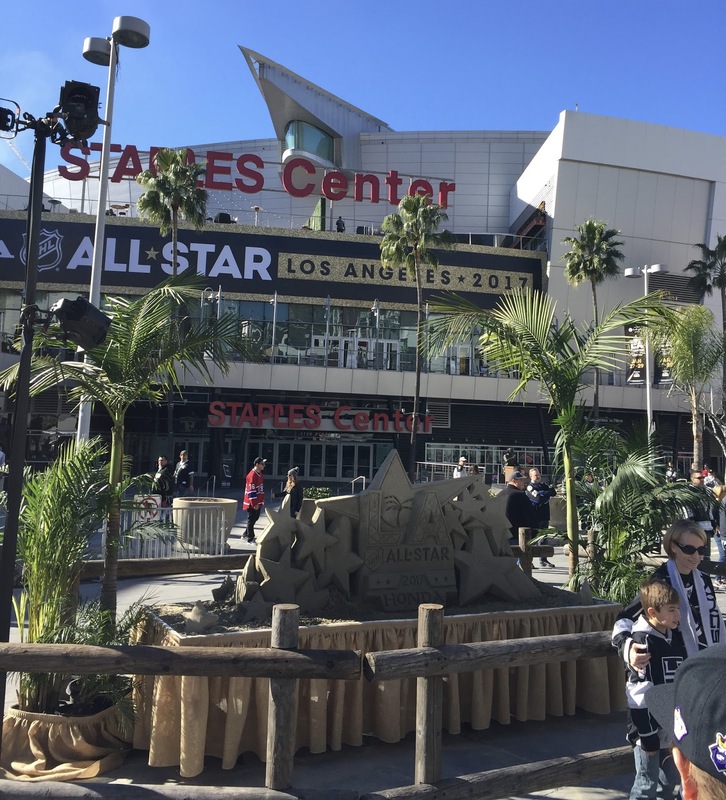 It goes without saying that if the NHL All-Star Game comes to your town, be sure to check it out! 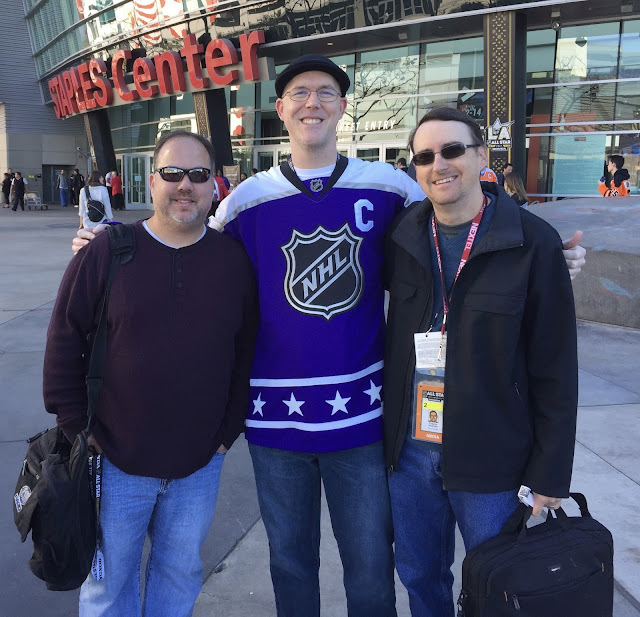 Chad and I discussed our All-Star Experience on his podcast, Positive Cynicism. You can listen to it here.